I have created a plugin package with 4 plugins that i normally use to expedite my work in sweethome3d. Thought i would share it with sweethome3d community. 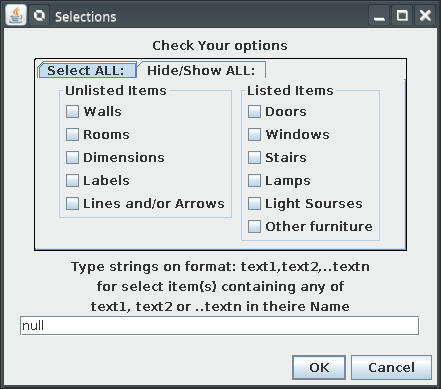 Option 8 helps to select all objects containing entered texts in there name. You need not have to enter entire text like "windows". only part of text like "dow" will also work. 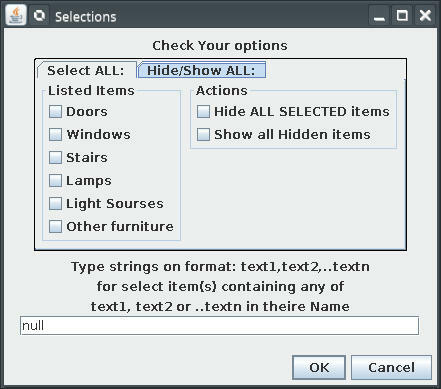 3)"Intelligent Hide/Show" -> To hide items at current selected level by entering values 1 to 7. use value 8 to show items hidden using option 1 to 7. Option 7 helps to hide all objects containing entered texts in there name. You need not have to enter entire text like "windows". only part of text like "dow" will also work. It copies properties of first selected object to similar other selected objects. plug-in may be deployed on the computer by simply copying "UtilityPlugin.sh3p" in the plug-ins folder. after copying file start sweethome3d. the plugin file contains the original source code files also..
Hope it is of some help to you all..
1) What is the difference between Duplicate Style and Copy / Paste Style? 2) I had the idea to add a Select all furniture / Select all walls / Select all ... for a long time, but never programmed it because I wonder if it could be really useful. Option 8 is an interesting idea. 3) I noticed that redo wasn't working in some cases. I found it useful and I decide myself to post this plug-in on sourceforge . I modify the original code to suits my needs. I add/remove few lines. -I modify the interface (radio buttons). Please don't shut the pianist; I'm not a programmer. The intention is to learn more and hope to improve it by more specific selections and combination of selections. Thank You cec! You are too kind. My unique neuron feel very happy! But I'm not satisfy yet. So I need to fallow the principle I've already enunciated. Now I must make this functional. Wile the few modification made for previously version took me two month, I don't know how much time I need to learn to do this. So don't make too much illusions!